Years ago, I was told the Internet boom was over. A week later, I sold my e-commerce creation, The Space Store, to a NASA contractor and it is still in business. Magazine mogul and Sagacity Media founder Nicole Vogel was told that print media was no longer a viable business strategy, yet she continues to succeed as do her publications. Ignoring those predicting the dismal future of print media, Vogel is showing the world how print media can and has evolved into a versatile entity, serving many needs for its audience. Vogel, seemingly a woman who never sleeps or sits still, has launched several publications including successful monthly magazines in Seattle, Portland and Houston. 1. Never underestimate the value of interpretive journalism. I've seen a real revitalization in print media mainly because we're showing the value of interpretive journalism. Yes, we carry news but we're separate from media that solely carries news. We offer news, reviews of restaurants, information about upcoming events and in depth stories about local community. While a reader may skim stories on a website, our average reader spends an hour or more with our publications. 2. Multiple platforms keep us top of mind. Multiple platforms are a vital part of our strategy. Not only do people want to read an in-depth story about their city in our magazine, they want to have us along on their electronic device for a brand recommendation or when they need a restaurant. We also remind our readers to visit our website through social media to stay abreast of breaking stories and to give them additional content to keep them coming back. 3. The competition has changed. We really had to widen the net as to whom our competitor really is. In some instances we're a competitor to the newspapers; in others, we're a competitor to Yelp. We're not just satisfying one need. We're valuable at all crossroads for the audience. 4. The audience is more diverse than you think. We own the lifestyle commuter and we should never forget our bread and butter, but that doesn't mean that that is our only audience. We are entrusted by our audience to provide multiple forms of information on multiple levels of media including partnering with other media such as local television stations to bring stories to the audience. Unlike magazines of the past, subscribers and newsstand sales don't provide our only audience. 5. You can have your own voice. Each city is different and what is news in one city, isn't necessarily important in another. While the northwest audience is a little more earnest, Texas is much more diverse. 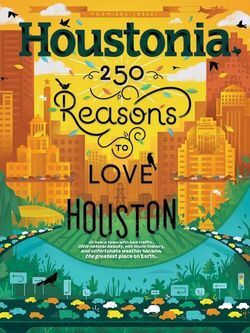 We did a cover on why Houston is better than Dallas which caused a ruckus in both Houston and Dallas across many social media sites. The rubric stays the same but the content has to change. Again, we aren't limited to being one form of entertainment, we've have an opportunity to bring all the best of a city to its audience in many ways. With Newsweek announcing plans to go back into the printing business this year, Vogel may just be on to something with this "magazine thing." What are you doing in your industry to not only shake things up but also survive and succeed?